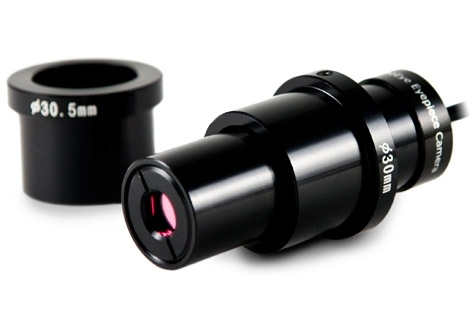 The Dino-Eye Premier AM4023X digital eyepiece is a very adaptable digital eyepiece that can fit 23mm, 30mm, and 30.5mm eyepiece slots with its included adapters with its tubular design that is great for setting the right focal point for different types of microscopes. It has a 1.3 Megapixels sensor with the ability for long exposures that's great for low light visibility. It allows clear and visible examination of specimens and superb viewing on a computer monitor.